The newest ad for Old Spice, "Motorcycle" features three guys who crack apart like porcelain while sitting in a hot tub just before riding off on a motorcycle. Old Spice quote..."The scents of Old Spice turn embarrassingly normal guys into face model champions who smell like adventure and fine cutlery. So douse your body regions with the scents of Old Spice and "Smell Better Than Yourself." Next Zales Valentines Commercial Song What You Do To Me Feat. Billy Danze, Jim Jones, Nicole Wray by Blakroc. The latest FedEx Ad directed by Randy Krallman tries to change the perception that some consumers have that the delivery company is still primarily focused on aiding giant Fortune 500 companies. 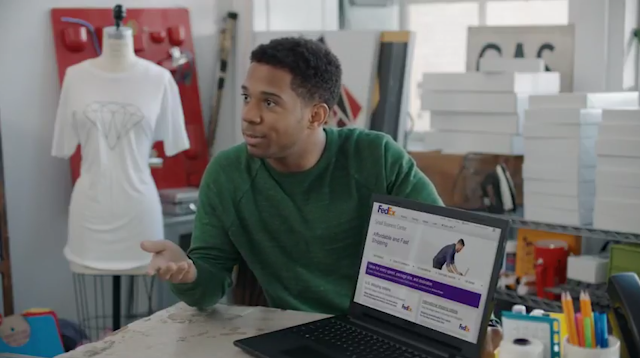 This new campaign aims to remind micro-business owners that FedEx Ground is more "affordable and fast" than they might think. The first spot, "Corner Office," features a business run out of a suburban home and "Buyout" showcases a tiny start-up in a warehouse. Both spots will debut this week on CNN and NFL games.